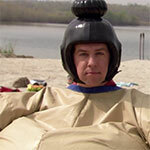 Andy Bernard was born Walter Bernard Jr. and later renamed at the age of six because his parents felt his younger brother better exemplified the name. So it doesn’t come as much of a surprise that he has a reputation for overcompensating and being a bit of a show-off. Although he was arguably overlooked by his parents all of his life, his family’s wealth has afforded him a great many opportunities. He is well versed in a number of skills including: acapella singing, playing the banjo, and guitar. Andy has been noted to wear several different hats throughout the course of the series, most notably his straw sun hat, red Cornell University hat and his DM does GB pink baseball cap. Which he had made for everyone in the office to commemorate an office field trip to Gettysburg. ​Andy’s hats are usually worn for a specific purpose or occasion and aren’t generally a part of his everyday wardrobe. Throughout the course of the series, Andy has been noted to wear a number of different disguises as well as costumes (even when it isn’t completely necessary). Including: an inflatable sumo wrestler suit, a Santa Claus costume, a construction worker costume, and even an unconvincing auto-mechanic disguise. ​So without further ado, let’s go over some of the items that Andy’s costumes are comprised of. As I mentioned previously, Andy is a talented musician who is proficient at vocals, guitar, and even banjo. ​Here is a vintage sunburst acoustic guitar that is a perfect match to the one played by Andy several times throughout the course of the series. Most notably during his impersonation of George Michael. ​This Macbook by Apple is very similar to the laptop computer Andy keeps at his desk as Branch Manager of Dunder Mifflin Scranton/Sabre. Rounding out our list of Andy’s accessories is his inflatable twin size mattress, which he keeps with him at the office for just such the occasion that he becomes intoxicated and needs to sleep at work.​ Here is a link to purchase this item for your convenience.